Last year, I had trouble with some vegetable crops (zucchini and corn) because they weren’t being pollinated. This year, I’m going to have lots of flowers to get those pollinators in my garden. This is great for me, because I’m more comfortable in the flower world. Even though I am a flower person, I’m not so familiar with a lot of the flowers that seem to be considered traditional pollinator attractors. But which flowers do the best job of bringing the bees, birds and butterflies to the garden? After doing the research, here are the seeds that I picked up with the intent of attracting these pollinators. What is that? It’s one of those flowers that I’d never heard of, but when I started investigating pollinators, this one was on every list. I got a packet from Botanical Interests. I’ll direct sow (love a direct sow seed) in my raised beds two weeks before our average last frost date. I got a tip from @libraryseedbank that borage and tomatoes get along well, so they’ll be together in my garden. Blue flowers – my favorite color. 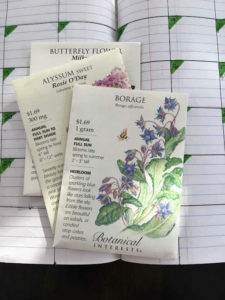 A few other bonuses: The seed packet also says that borage is deer resistant. And the flowers are edible, so my salads are going to be even more beautiful. Bee balm. Monarda Wild Bergamot. I don’t know why this plant has so many different names, but one of them has “bee” right in it. The packet recommends keeping them inside for six to eight weeks, so I’ll probably start them mid-March with my tomatoes and then move them outside mid-May. I bought a packet of Wild Bergamot from Johnny’s Selected Seeds. This perennial variety grows 36 to 48 inches tall, so I won’t put it in my raised beds but somewhere nearby. Who knew these sweet little flowers were so good for pollination? Well, not me. Another deer resistant variety, the alyssum I picked up is Rosie O’Day, a purplish-pink variety from Botanical Interests. I’ll start this annual inside, four weeks before our last frost date. It’s only four inches tall, so it won’t block the sun for any of my vegetables. Great for the ends of raised beds. Grew zinnia last year, they were killer and I have to grow more. I have some leftover seeds from last year that I’m going to try again: Candy Cane Red On White and Purple Prince, both from Burpee. I thought Candy Cane was going to be a sea of crazy red and white striped flowers, but only some in the mix have this coloring. Purple Prince ended up being my favorite. I didn’t do a good job with pinching them back as they grew, so they were tall and not very bushy. I’ll put these in big planter boxes near the raised beds, but start them inside four weeks before our last frost date. Butterfly Flower. Milkweed. Asclepsias Tuberosa. It’s the Perennial Plant Association’s Plant of the Year for 2017 and it could use the publicity. Another plant I don’t feel is very well-known. And the names milkweed and butterfly weed aren’t doing anything for it, but it’s beautiful! Monarch butterflies love milkweed, so we’ll see how it goes. Another perennial. I got a packet of Asclepsias tuberosa seeds from Botanical Interests. I heard in the Encyclopedia Botanica podcast (I’m a big fan) that you should plant your pollinator attractors on the edges of your garden beds and not intermingled in with your veggies. I asked Petitti Garden Center’s Noelle Akin about this practice and she said it’s because the flowers that attract bees and butterflies can also attract the bad bugs you don’t want near your veggies. In an outdoor environment, the ecosystem will take care of itself, but best not to tempt the bad bugs too close to your plants. I really enjoy your articles. I would like to see your growing area in your basement sometime when I am over. Sounds very scientific. Hope you have a great garden this year!